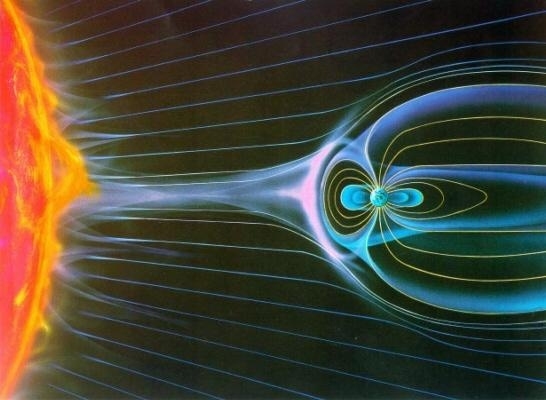 Sketch of the interaction between the solar wind and a magnetized planet (e.g. Earth, Jupiter). The pinkish area on the Sun-side of the planet symbolizes the solar wind conversion into heat. In the case of magnetized planets, most of the solar wind is first decelerated from supersonic to subsonic speed when it crosses a boundary layer called a bow shock, located ahead of such planet. The Earth's bow shock is located at about one fourth the distance to the Moon in the direction of the Sun.